Ohio House Bill 113 requires all graduating seniors in the state of Ohio to have hands on CPR and AED training as a requirement to receive their diploma. Tri-Village Local School District nurse Jodi Fritz became certified to teach CPR recently, but was in need of training equipment in order to teach students effective CPR and AED use. TASKS, Inc. (Teaching About Safety Kids Style) stepped in with a donation sizeable enough to make the acquisition of this equipment possible. Included in the purchase were four AED trainers, ten adult manikins, three child manikins, and six infant manikins. This gift is expected to impact 65-80 students per year in the sophomore class, plus additional classes as needed and requested by the students. The manikins purchased include an electronic CPR rate monitor that gives immediate feedback on whether the student is performing effective chest compressions. According to Fritz, “the CPR rate monitor allows for instant feedback to the instructor and students regarding the rate of chest compression, which allows each student to gauge their rate of compressions on their own, as well as allowing the instructor to monitor several students quickly and easily.” The AED trainers are fully automated to simulate AEDs found around the school and in many public buildings. TASKS, Inc. is proud to partner with Tri-Village Local School District to provide these vital teaching aids. 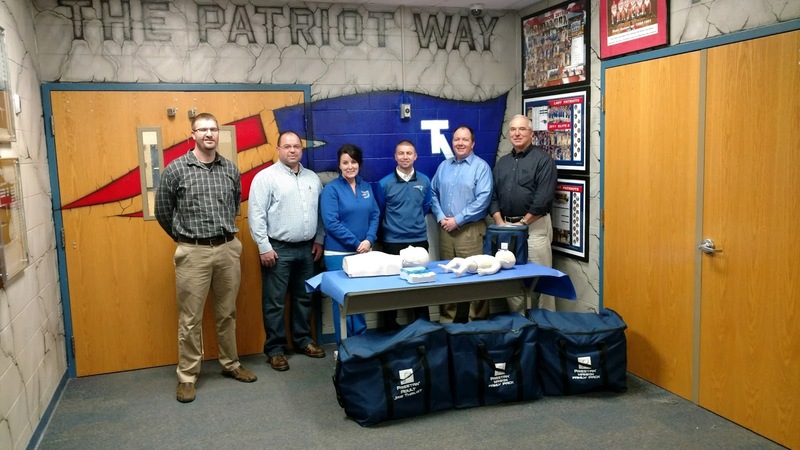 Tri-Village is one of five Darke County schools to receive funding from TASKS for CPR training equipment. Other schools that have received similar awards are Versailles, Arcanum, Bradford, and Mississinawa Valley. As a 501(c)3, any donations made to TASKS, Inc. are fully tax deductible and supported with a receipt and thank you letter from the organization. If you would be interested in donating to TASKS, donations may be sent to TASKS, Inc., 28 E. Ward St., Versailles, OH 45380. If you have any questions about our organization or the programs we would support, you may contact Scott Garrison at 937-371-1249. Pictured above are TASKS board members Ted Braun and Brian Pearson, Tri-Village school nurse Jodi Fritz, Superintendent Josh Sagester, and TASKS board members Scott Garrison and Bob Frey.